A 36 year old woman presented with secondary infertility. She had a 19 month old baby. She had planned a second pregnancy for 7 months. She had noted that her cycles were significantly lighter following the birth of the baby. Imaging of the uterine cavity (sonohysterogram) revealed significant intra-uterine adhesions (Asherman's Syndrome). These were divided at Hysteroscopy. The pathology revealed placental elements. 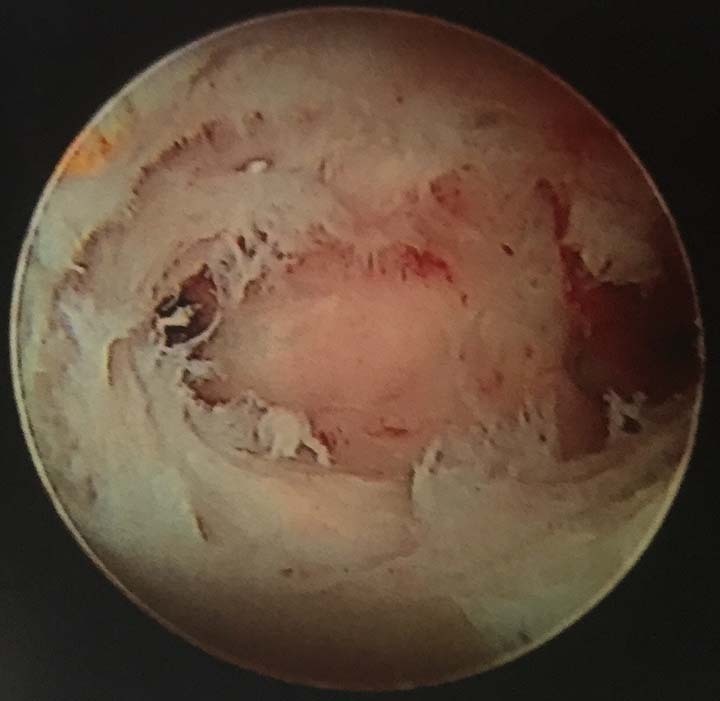 Significant intra-uterine adhesions seen at Hysteroscopy. Dividing the adhesions at Hysteroscopy. The uterine cavity is slowly opened up. The uterine cavity at the end of the procedure. Openings of the tubes into the uterus are seen.